During my childhood, soup was part of our daily menu. Sometimes it was the only thing on the menu, especially at lunch time. My mom would cook some kind of soup every single day, so we all grew up loving and craving soups. Soups are actually very good for you, since they contain so much liquid, plus a variety of veggies. Eating soup on a cold day makes you feel so warm and fuzzy, inside and out. Don’t you agree? Today I will share a recipe for a Cream of Potato soup, which for most part is based on a recipe from the The Pioneer Woman, but I doctored it a little, to suit our taste. A hearty piece of fresh bread makes an excellent accompaniment to this delicious, creamy potato soup. This recipe yields about 8-10 servings. Heat up a large soup pot, add chopped bacon, and cook until all fat is sizzled out and bacon is crispy. Using a slotted spoon, remove the bacon bits and set aside. If you have a lot of bacon fat, remove most of it, except for 2 Tbs. Add chopped onions, carrots and celery to the fat and cook, stirring often, until veggies are translucent (5-10 minutes). Add chopped garlic, and cook for 1 minute. Add the chopped potatoes, and cook 5 minutes longer, stirring often so veggies do not stick to the bottom of the pot. Pour in the broth, and water/bouillon mixture. Mix well to loosen up the bacon particles off the bottom of the pot. Add bay leaf, salt and pepper to taste. Pour 2 Tbs. of milk into a cup, add the flour and make a paste. Mix in the remaining milk, and add to the soup. Using a slotted spoon, remove about 3/4 of the veggies from the soup, into a blender or food processor, and process to form a creamy paste. Pour this puree back into the soup pot, to combine with the rest of the soup. Add the paprika, and additional salt and pepper, if needed. Stir in cream, 1 Tbs. of Parsley and dill. Save 1 Tbs. of Parsley for garnish. 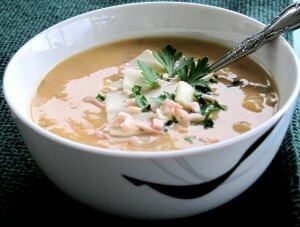 Serve hot soup in bowls, garnished with Parsley, bacon bits, and some grated cheese or sour cream (optional). I liked the crispiness of the bacon bits in this soup, used as a garnish.